The most attention mine ever receive is choosing a nail varnish colour and what shoes to wear. I’ve never, ever been for a pedicure before, normally I avoid anything to do with feet like the plague. 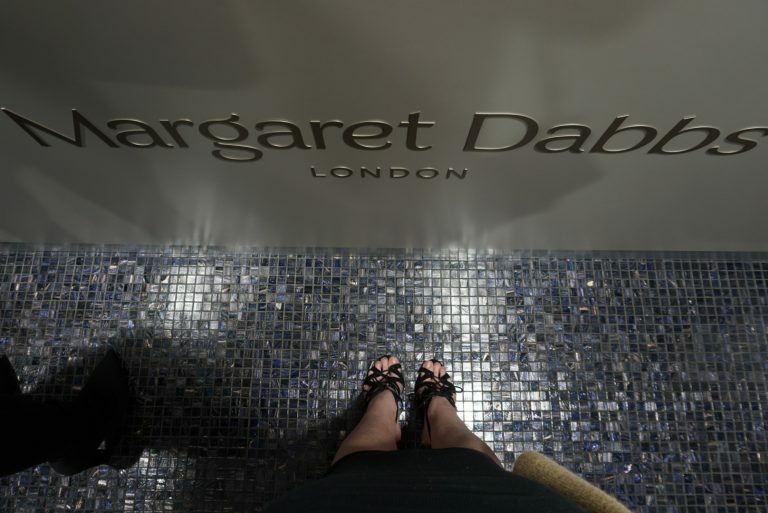 However, I was recently invited to Margaret Dabbs London to experience one of their pedicure treatments and decided to go for it. I’m 26 years old, it’s definitely time to experience a pedicure. Making us all cringe since day 1. 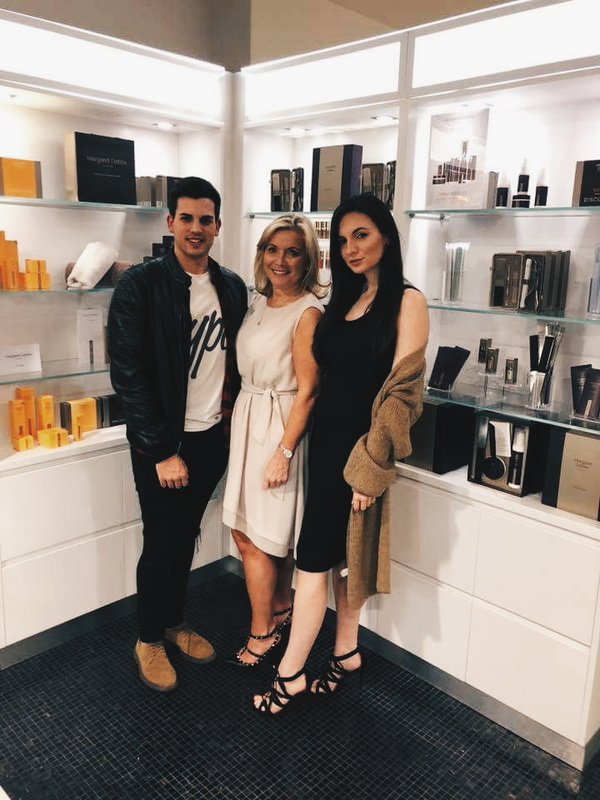 The event took place at the Margaret Dabbs Salon in Alderley Edge, and as you can probably imagine, it oozed luxury and class from every corner. 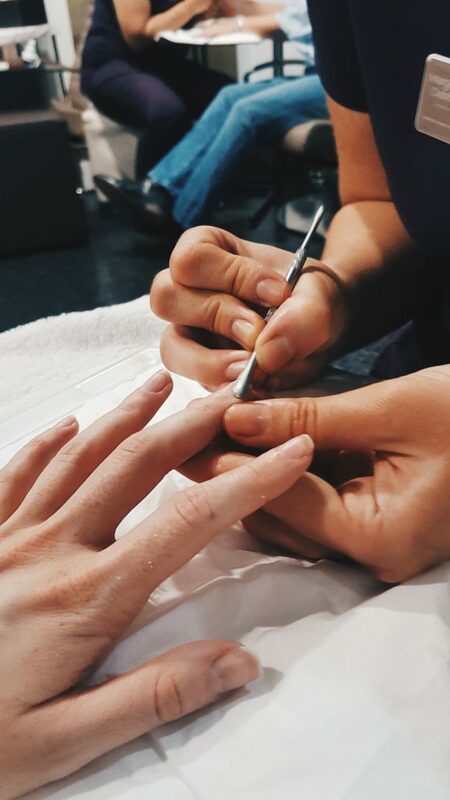 When I arrived, I was introduced to one of the podiatrists, Maria who was going to be doing a mini version of one of their most popular services, The Medi Pedi. Usually this service would last a total of 45 minutes but my treatment would be around half of that which I thought was perfect. 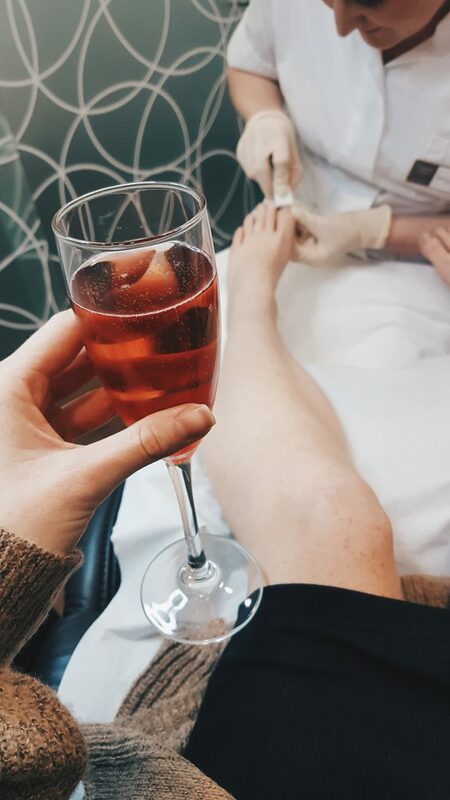 Time to get the show on the road, Maria showed me into one of the private treatment rooms where I slipped off my Kurt Geiger’s, into one of the comfiest chairs I’ve ever sat in and put my feet up with a nice glass of champagne. Someone please remind me again why I have never done this before? The private treatment rooms are one thing that I did immediately appreciate, I think one of the reasons I’ve been put off having a pedicure before is due to the fact that the majority of beauty salons I have frequented have had their pedicure station in the middle of the salon for the world to observe. I’ve seen the manky stuff that comes off of people’s feet when I’ve been sat having my nails done, I would die if if people were sat watching a load of dead skin be scraped from my feet while they were getting their manicure. vom. Needless to say, the private treatment rooms are a fabulous touch. As Maria was removing all of her equipment from its steralised packaging and setting up her station, she asked if I had any concerns about my feet. To which I answered no but then proceeded to ask a gazillion questions, to which I was surprised to find that she knew the answers to every single one. It’s actually quite amazing how intricate our little trotters are. Did you know they go through an aging process just like the rest of our bodies? I didn’t I thought it was just a case of the skin aging as it does every where else but apparently, it goes much deeper than that to the point where components of our feet actually move and fat cells reduce. Deteriorated fat cells are one of the (many) reasons people of the older generation may find it painful to walk. Throughout the treatment, Maria and I chatted away. We got onto the fact that my feet turn in rather a lot more than normal due to hyper-mobility but what impressed me most about Maria is that she knew it stemmed from my hips rather than from my ankles, which I know to be true having had a body posture analysis performed. She also knew exactly what I was going to say before I said it when it came to symptoms/complaints of hyper-mobility. I have serious doubts as to whether any beautician would have half of the knowledge possessed by Maria. Very impressed. I was really enjoying this pedicure so much that I was actually disappointed when it was over. I did manage to sneak in a quick manicure after the pedicure though so it’s not all bad! My nails were all shiny & perfectly shaped, my skin was all smooth & soft. They definitely felt like they had been treated. In fact, my feet have literally never felt so good and for the first time, I wasn’t embarrassed by them. Fortunately, there wasn’t too much to be done to my feet. However, if there were any ingrown toe nails, issues with bunions or even acute tissue damage that could have also been dealt with. 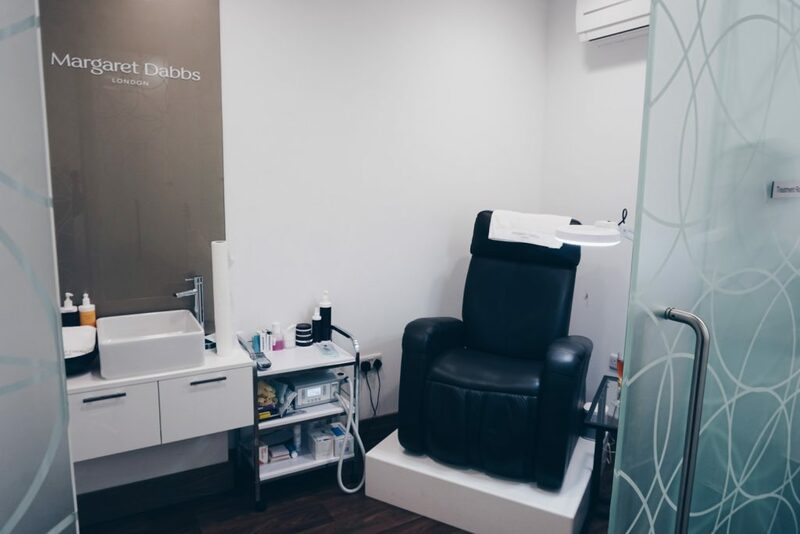 Speaking of acute tissue damage, Margaret Dabbs Salons have a laser treatment which can help recovery so next time you’ve been on a night out and wake up still feeling like you are wearing your heels, get yourself to Margaret Dabbs for the laser treatment! 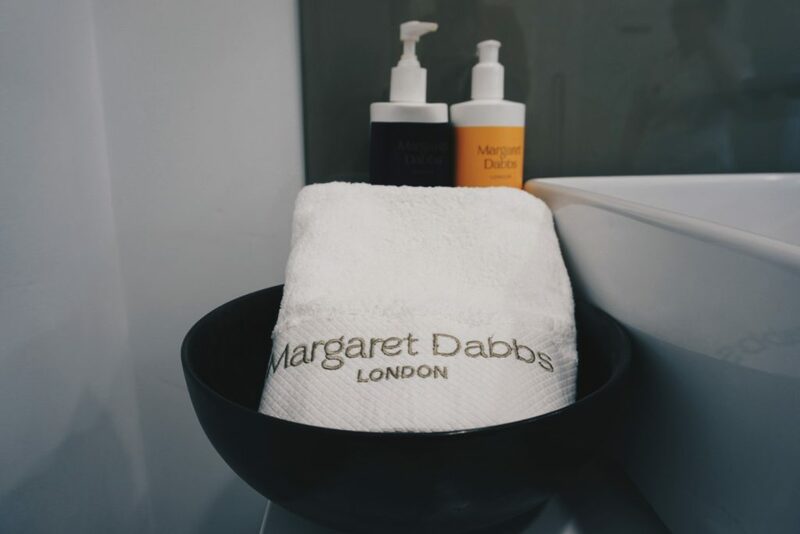 Over the course of the evening, I also had the pleasure of meeting Margaret Dabbs herself, after receiving numerous compliments on my tiny size 3 feet and chatting with Margaret about her salons and the treatments on offer, it was so clear to see how passionate she was. Understandably so too, up until this evening I had never given my feet a second thought. Just think for a second how difficult life would be if suddenly we were unable to use our feet or they became painful. Chances are we are all guilty of taking our walking aids for granted and should definitely be paying them a lot more care and attention. My good friend, Pablo AKA Mr Trainers and I with Margaret Dabbs herself. It was a fabulous evening and a fabulous first pedicure experience. My only concern now is that I will never find anywhere near as good, looks like I’ll be going to Margaret Dabbs for life now! 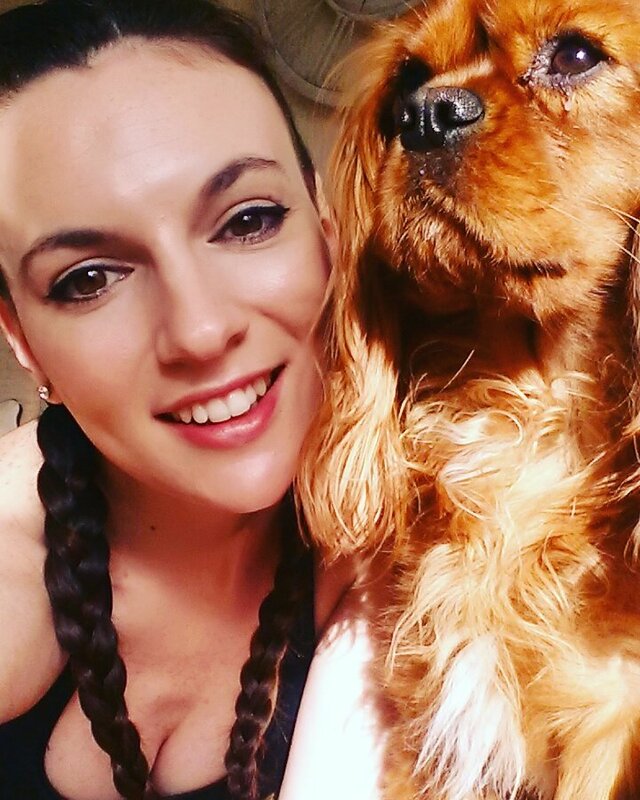 Whether it means travelling to the Alderley Edge Salon, the London Salon or the Dubai Salon, I’m totally OK with it!